Asheville is a city nestled in the Appalachian Mountains with a growing population and a strong tourism industry. It is also home to the University of North Carolina at Asheville (UNC Asheville) and approximately 4,000 students. More than five percent of trips to work are made either on foot or by bicycle, which is well above the state average. This active commuting coupled with the large number of tourists who explore the city on foot or on two wheels make it easy to see why pedestrian and bicyclist safety are important issues for Asheville. Asheville’s Department of Transportation is the lead agency in the city’s Watch for Me NC campaign, but they have an array of local partners in the areas of law enforcement, education, local government, public health, and cycling advocacy. These partners include: the City of Asheville and UNC Asheville police departments; several schools, including Asheville-Buncombe Technical Community College and Asheville City Schools; local Active Routes to Schools programs; the Buncombe County District Attorney; local healthcare provider Mountain Area Health Education Center; and several bicycle advocacy groups, including the Blue Ridge Bicycle Club, Asheville on Bikes, and Western NC Bicycle Dealer’s Association. Asheville launched the Watch for Me NC campaign in conjunction with a popular “National Night Out” event. Asheville’s Watch for Me NC partners issued press releases about the program through various social media channels and distributed hundreds of campaign materials, including brochures, rack cards, bumper stickers, bike lights, and more at community events. Finally, to engage the public more broadly, the city created its own educational videos that describe the program and explain laws regarding crosswalks, both of which can be found on YouTube. More than 10 enforcement operations occur in Asheville each year, either conducted by UNC Asheville police or City of Asheville police. Operations focus on verbal warnings to drivers for dangerous driving and failure to yield to pedestrians or bicyclists. Verbal warnings are given to pedestrians for improper crossings. Asheville also extensively distributes educational brochures and safety materials such as bike lights during enforcement operations. Most operations occur between August and October, which coincides with the peak tourist season and the beginning of UNC Asheville classes. Asheville reported a substantial reduction in pedestrian crashes since the beginning of the Watch for Me NC campaign. 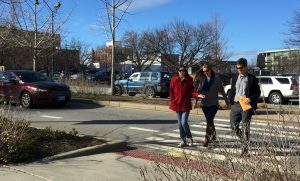 Staff documented a citywide 27 percent reduction in pedestrian- and bicycle-related crashes relative to the same average time period from 2010 to 2014. In Asheville, Watch for Me NC is part of a broader set of initiatives to improve safety for all road users. This may impact the observed safety improvements. A key lesson learned is the importance of proactively shaping the story before conducting enforcement by engaging the public and the media. Asheville faced some negative press coverage during the initial stages of the program due to a misunderstanding that police were targeting pedestrians for jaywalking. Thus, press releases before enforcement, and outreach to key stakeholders such as the advocacy community, may help Watch for Me NC partners avoid misconceptions about the aims of enforcement. In the future, the city plans to communicate with pedestrian advocates to foster a better understanding of program objectives to address all road users, including motorists and cyclists, and not to solely target pedestrians. Additionally, Asheville intends to establish more partnerships before expanding the program. Thanks to Barb Mee, Pedestrian and Bicycle Coordinator for the Asheville DOT and Officer Meg Pigman of the Asheville Police Department for providing leadership, time, and expertise that contributed to the Watch for Me NC Campaign in Asheville and the information in this profile.